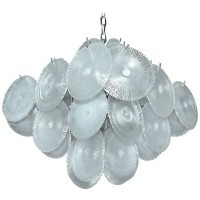 Rare and exquisite round disc Italian glass chandelier by Mazzega, Murano. Each handblown disc is a matte iridescent with hints of light blue-violet accents. Nickel-plated frame uses 8 – 40 watt max candelabra base bulbs. Rewired. Overall height with chain and ceiling cap 36″ and can be adjusted to suit.